BANGI, 29 Aug 2012 – Malaysia will launch its own compact space satellite “Nanosatellite” designed and built by the Institute of Space Sciences (ANGKASA) of The National University of Malaysia (UKM) to monitor the Ionosphere. ANGKASA Director, Professor Dr Mohd Alauddin Mohd Ali said the launching of the nanosatellite is a cost-effective way to gain data about the earth. Such a satellite costs in the region of hundreds of thousands of ringgit instead of the tens of millions for a conventional-sized satellite. While it costs about RM27 million to send an astronaut into space. “Nanosatellite” or “nanosat” is an artificial satellite with a mass of between one to 10 kg. It is designed to be part of a group of multiple nanosatellites working together in a formation. 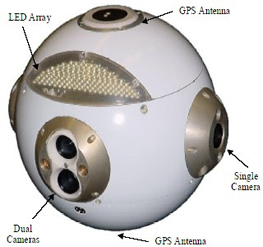 Nanosats usually require innovative propulsion, attitude control, communication and computation systems. Some designs require a larger “mother” satellite for communication with ground controllers or for launching and docking with other nanosatellites. Prof Alauddin said UKM’s invested some RM150,000 from a government grant in the device and its launch. It is part of a United Nations consortium led by a Spanish research team which is encouraging nations to join by sharing data through a network of earth satellites around the globe. In this way, developing nations will be able to afford launching data-sensing devices at reasonable cost and be able to receive information from other participants. The date and the launch site has yet to be finalised and several nations, including China and the United States are willing to propel the nanosatellite by docking to a bigger satellite, possibly from a third nation. Prof Alauddin said the programme was first scheduled for 2009 when such a devise was to have been sent up in a piggy-back with the much bigger RazakSAT satellite, also Malaysian-owned. It was, however, put on hold due to some technical hitch. The RazatSAT was launched successfully but the signals from it is now not as clear as it should be because of some technical faults. ANGKASA and several other teams in Malaysia have been tracking RazakSat which carries a high-resolution camera. It was launched into low Earth orbit and placed into a near-equatorial orbit that presents many imaging opportunities for the equatorial region, including South-East Asia. The new satellite is designed to monitor changes in the ionosphere caused by Solar Flares. Prof Alauddin said many countries are concerned that the Sun is setting off flares more often which can cause havoc with communications equipment and computers on Earth. Larger satellites usually use monopropellants or bipropellant combustion rockets for propulsion and attitude control; these systems are complex and require a minimal amount of volume to surface area to dissipate heat. These systems are used on larger microsats, while other nanosats have to use electric propulsion, compressed gas, vaporizable liquids such as butane or carbon dioxide or other innovative propulsion systems that are simple and economical. Electronics need to be rigorously tested and modified to be “space hardened” or resistant to the outer space environment such as vacuum, microgravity, thermal extremes and radiation exposure. Miniaturized satellites offer opportunities for testing new hardware at reduced expense. Since the overall cost risk in the mission is much lower, more up-to-date but less space-proven technology can be incorporated into nanosats than can be used in much larger, more expensive missions with less likelihood for risk, Prof Alauddin said. In order to track the signals from the satellites, ANGKASA must receive signals that are of very high quality. It is vital that the signals, like sound waves, be received by antennas at tracking stations in the least distorted state. For this, the transmitters in the satellite must be faultless. The other factor is that the antenna at the earth station must also be very sensitive and not distort the signals. ANGKASA is equipped with an Anechoic Chamber to test the quality of antenna and radar of earth stations. An Anechoic Chamber (non-echoing or echo-free) is a room designed to stop reflections of either sound or electromagnetic waves. They are also insulated from exterior sources of noise. The combination of both aspects means they simulate a quiet open-space of infinite dimension, which is useful when exterior influences would otherwise give false results. Such chambers were originally used in the context of acoustics (sound waves) to minimize the reflections in a room. More recently, rooms designed to reduce reflection and external noise in radio frequencies have been used to test antennas, radars, or electromagnetic interferences. Anechoic chambers are enclosed areas designed to completely absorb sound and radio waves, thereby allowing researchers to test different radio-frequency device characteristics with no interference from reflected radio waves. The anechoic chambers allow empirical measurements of antenna parameters such as radiation patterns and gain and to characterise the RF performance of antenna systems. 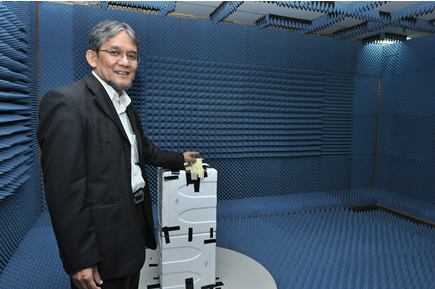 The ANGKASA anechoic chamber was constructed with research support from the National Defense Academy, Japan. The chamber was implemented in a controlled environment. The contemporary antenna chambers are designed to accommodate a broad range of antennas of different sizes and operating frequencies. This chamber was also designed with limited space in the microwave lab of UKM with measurement-hardware limitations and microwave-absorber specifications. Founded on 1st August 2003, ANGKASA was established as a multidisciplinary research centre that offers graduate level education and research in the fields of Space Science and Technology and Applications. ANGKASA hit the headlines in 2007 with a surge of public interest in Space Science when Dr Sheikh Muzaphar Shukor Sheikh Mustapha was selected to be the first Malaysian astronaut. Dr Sheikh Muszaphar and two other cosmonauts were launched into earth’s lower orbit where an International Space Station was located. Dr Sheikh Muszaphar has since become ANGKASA’s advisor and regularly givers talks at seminars on space technology.